There have been several myths surrounding issues concerning diabetes, with most being mere assumptions. These myths have raised confusions in the heart of many that are yet to believe them because they lack medical basis. At the same time they provide contentment to many that accepted, who neither embark on research nor raise enquiries. Like i stated in the introduction, not all myths about diabetes are actually true. 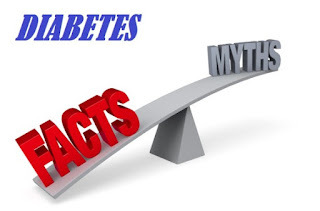 Below are 7 myths about diabetes and their actual facts or truth. Read on as you get yourself acquainted with them. Once you are diagnosed with diabetes, it is compulsory you go for insulin shots. Fact: This myth is not true, because if Type 2 diabetes is detected early enough, it can be managed by adopting healthy lifestyle choices like diet and exercise. If the case is more advanced, there are multiple oral medications that can control blood glucose levels. The truth is that if you have diabetes, it is not compulsory for you to be on insulin shots. Fact: The truth is that diabetes can remain undetected in your body for a long period until you blood sugar level is drastically high. Some few signs can include increased carbohydrate or sugar cravings, feeling fatigued or lacking energy even having a long sleep. Fact: This myth about diabetes is not actually true because you can have diabetes for many years without actually knowing it. The average person diagnosed with Type 2 diabetes actually had it for years prior to diagnosis. Fact: It should not be categorised as a death sentence because Type 2 diabetes is extremely controllable with medications and adopting a healthy lifestyle. If it is properly managed on a daily basis it can keep your life in balance and normal. Fact: Managing your blood sugars and diabetes means you have a balance of enough protein, moderate amounts of carbohydrate and good fat at your meals and snacks. Small amounts of sugar like in dark chocolate have minimal effects on your glucose levels if consumed in moderate quantities. Since I now have diabetes I have to eat a rigid diet of boiled chicken and steamed broccoli. Now that I have diabetes I’m afraid I will go blind or have to have an amputation. Fact: Controlling your blood sugars means having little to no risk of health issues such as eye disease or having to undergo amputations. A blood test known as glycosylated hemoglobin A1C shows what your blood glucose values are averaging over a three-month period. Keeping that number in close to normal range dramatically lowers the risk of medical complications. This is just a post showing 7 myths about diabetes debunked. You should not accept a health issue based on assumptions, it is always better you consult your health care providers. Feel free to share this piece of information by using the social share icons below and ensure you follow us on Facebook and Twitter for our latest feeds. Your contributions will be greatly appreciated too, so what are you waiting for? Kindly use the comment box below.